Tired but needed to remove my previous nail polish and art because the 'feathers' were feathering. Haha...ok, I know, lame. So, I decided to do something simple and a twist on the classic French. 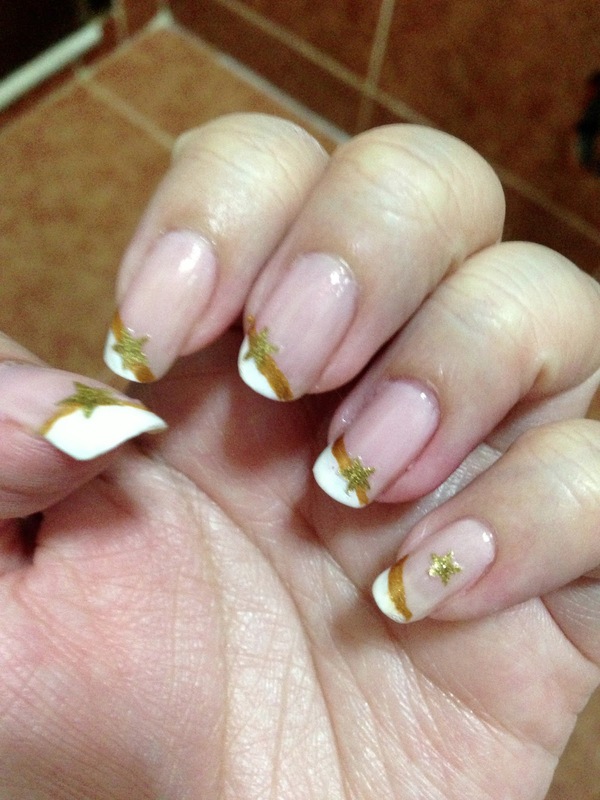 It's a side French with a gold stripe accentuating it and then I stuck on gold stars on each nail too! It was inspired by a design that I saw in Nail Up but the effect isn't the same because my nails aren't long enough and I should've used the finer tip of my dotting tool. Alas, I made the mistake early on and I might as well continue doing it throughout all 10 fingers. There are a few other designs that I am tempted to do and I'd love to paint a Minion-themed one (minions from 'Despicable Me') but I do not have yellow nail polish. Nor grey. I'm not going to buy 2 bottles JUST so that I can satisfy my love for these adorable minions. Anyway, if you have ideas, do ping me on my chat or instagram me!